Thought I would share something different for this blog and do something visual. One of the tasks, fairly towards the end of “The Artist’s Way”, and one of the more time-consuming ones, is to take about 10 magazines or papers and flick through, tearing out any images that seem to resonate or appeal to you. Once having done so, create a collage. The original task is meant to help you envisage and help you target your aspirations. It’s meant to appeal to you as a developing artist at that moment in time. 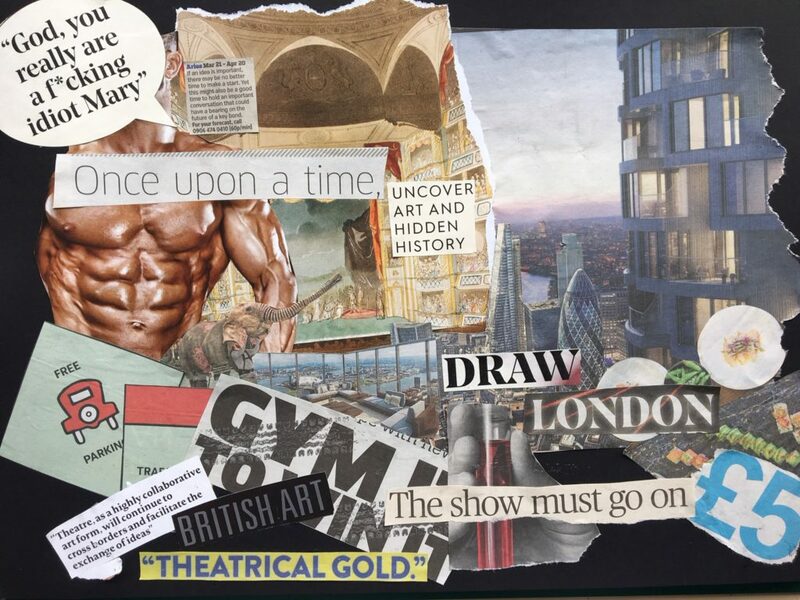 I never found the collage the first time that aspirational, I couldn’t quite see it as a way to create an image of me in the future and the goals I was going to achieve. It did, however, offer me a chance to just be creative for the hell of it and make something that had no real purpose other than to just satisfy me. – The previous image seems a lot more chaotic, the current focuses on form, layout and landscape a lot more. -The current image involves a lot of property (clearly on my mind as I’m thinking about ways to buy a house). – The quotes in the current image feel very aspirational and empowering. The previous just seem frivolous and disconnected. – The current feels like a sense of perspective. The previous seems like an up close examination under a microscope. I’m likely to do another in 3 months, let’s see how things change… If anyone fancies undertaking the exercise, it can be really quite satisfying to just sit and be creatively indulgent without having to spend a lot of money. It’s a great way of channelling your creativity in a new form or simply reconnecting with creativity in the first place. As a followup, my thoughts on the 174 days of Morning pages created as part of my journey on “The Artist’s Way” can be found here. 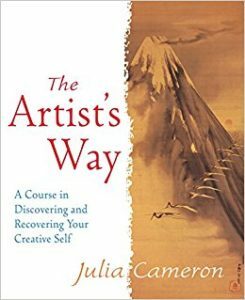 Again, another book always on the recommended reading lists for any creative practitioner or artist, and one of the most talked about. It only seemed right in my own journey of creative evolution that I put myself through the 12 week process to examine my own creativity. 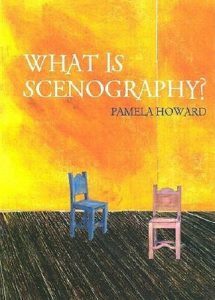 For anyone who hasn’t come across this read, Cameron was a scriptwriter in Hollywood, boasting Spielberg and Scorsese as some of her friends and colleagues. 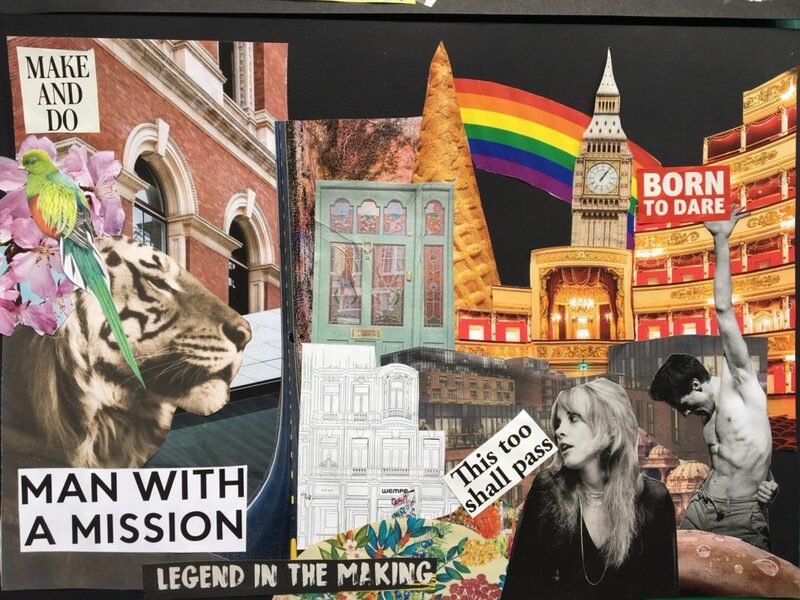 “The Artist’s Way” developed in response to Cameron teaching a class on scriptwriting and her students claiming to have no creativity, and also her own experiences as a artist. It has now taken on its own following, spawning many follow on works and groups around the world…. The book compromises of 12 chapters of working weeks, each focusing on a different aspect of your creativity or existence as an artist. Each contains essays written by Cameron exploring deeper the topics being spot lit that week and then some following homework. Included also are a few rather lengthy chapters of introduction which set up the whole context for what you are letting yourself into and introducing two key concepts that come into use throughout the book: Morning Pages and Artist Dates. Morning Pages are three A4 pages of conscious thought, written longhand, preferably done in the morning. An Artist Date sets aside few hours each week in which you indulge your inner artist in something you want to do. Some of mine in the last few weeks have included baking, walking, painting whilst listening to favourite album, walking around a food market, visiting a gallery, the cinema the other side of London to see a very obscure choice of film. To clarify, Cameron hopes that in undertaking her course you rediscover your creativity, or further indulge in your creative tendencies. I expected it to be very different to what it actually is. Whilst expected tasks like collages and drawing are included, there’s also quite a lot of analysing, making lists, comparing and documenting. I wonder if this is why some of my colleagues struggled with it, it doesn’t immeadiately scream “this will make you more creative!”. What it does do, and I only realised this as I was coming to the end of the 12 weeks, is present you with a huge amount of evidence about yourself and gives you permission to explore realms of possibilities you may rule out in the day to day running of your life. It’s an excellent way to gain a distanced perspective of you as a whole person, from an honest and well rounded point of view. 12 weeks is a long time and I can’t say I enjoyed what was asked of me every week. I had to bear in mind that it’s a process that has been devised and refined for a specific reasoning to cause effect. Overall, take it with a pinch of salt and read into it what you will. Cameron refers to God in the book quite often, but you don’t need to believe in such a concept or be religious, I certainly don’t. Cameron merely asks you to believe in energy greater than you and that I can get on board with – this book is about opening up to possibilities, the world and energies around you and letting yourself channel them. I’d recommend “The Artist’s Way” to anyone, whether they were wanting to pursue a creative lifestyle or not, it’s a really delightful journey to reconnect with yourself and your key values. You emerge from the 12 weeks a better, more coloured-in version of yourself. For those of you wondering, and maybe have read the radical changes that some people have made in their lives after doing this book, divorcing partners, selling their belongings etc, there’s very little in this book that asks you to completely change your world. Moreover, it merely asks you to reconnect with yourself and harness the power of possibilities.